"Shana Tova" means good year in Hebrew. It occurs about once a year, in Gregorian terms, around the fall. The Hebrew year goes by the moon, so syncing with the Gregorian calendar is a bit complex and interesting exercise. This is the time where Jewish people around the world, regardless of how religious they are, send their best wishes for the coming year to their loved ones. I would like to send my "Shana Tova" to everyone reading this. May your next year be much better than the last, and may all your best wishes come true. This is also an opportunity to ask for forgiveness, if I hurt anyone in any way. I hope that you'll accept it. It has come as somewhat of a surprise this week, but through all the recent market turbulence, SZDM, my marketocracy model portfolio, finished the week nicely in green: it was up 1.07% in the past 5 trading days, once again beating the S&P 500. It seems like rain or shine, the gap of SZDM vs. the market keeps increasing. 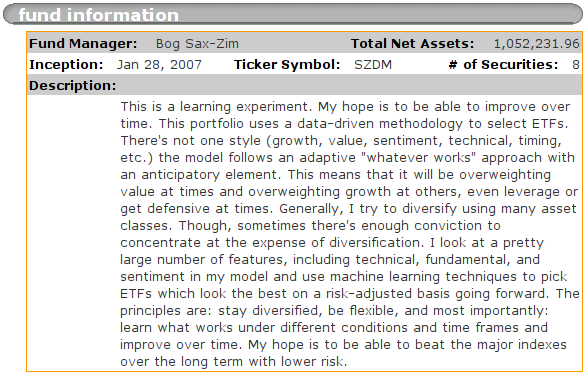 SZDM now leads the S&P 500 by 17.32% since its inception on Jan 28, 2007. This translates to 10.57% over the S&P 500, on an annual basis, with all the Marketocracy handicaps applied. Looking at the chart below, this out-performance has grown over time. During the 1st year, SZDM managed to maintain a small and pretty slowly increasing lead over the 3 major indexes, despite the significant 2%/year (on the total balance) drag imposed by the challenging marketocracy rules their above average simulated trade commissions, missing tickers, and painful slowness of the site. I was generally happy with being able to keep above the indexes after the 2% guaranteed haircut. Then came the bear, and I realized I can do much better. Paired trades, carefully selective shorting and some intermediate-term timing contrary to prevailing sentiments ideas, each contributed a part to this growing out-performance. But I believe, this is just the beginning. 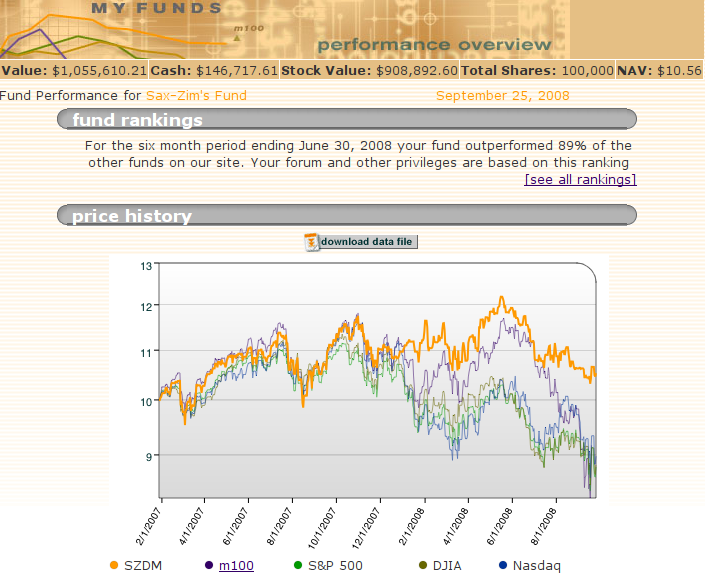 It was only during the bear period that SZDM was able to beat, not only the 3 major indexes, but also the average of "the m100," (the 100 best investors on the site) as represented by the dark-purple line on the above chart. One should note that the m100 is not a fixed group, so survivorship bias applies. The next year m100, should be different than the last year m100. Obviously, some of any out-performance is a matter of sheer luck. This explains how come last year's m100 has performed so badly lately. Those who were riding the commodities/energy bubble have faltered and their record has deteriorated. This is also why Marketocracy keeps emphasizing to its members that they should seek a long-term and stable record as opposed to lucky strikes. In the first leg of the bear market, from November 2007 till about June 2008, SZDM not only managed to hold well in relative terms, it was also nicely up by June 2008 since the markets peaked in Oct 2007, and for the year. I then became a little too optimistic, and through a bad combination of negligence and false hopes, managed to lose some significant altitude. At that point by June-July 2008, the m100 managed to briefly catch-up with SZDM. Since then, markets have been as difficult to navigate as I can possibly imagine, with 3%+ unexpected daily moves in both directions becoming commonplace. During this challenging period, even though SZDM lost some more altitude, the lead over the m100 and the major indexes has widened pretty dramatically as a result of some good calls. Among them, shorting internationals and consumer-services, buying some select health-care ETFs at carefully chosen times, and lightening-up partially as the markets rose. Unfortunately, Marketocracy forces players to be mostly invested at all times. "As a money manager, you're not being paid to sit on cash" is their strange justification for this rule. This makes managing a Marketocracy portfolio successfully, even more challenging than managing one's own real-life portfolio. Right now, SZDM is 86.1% invested, expecting the bailout-plan rebound and the calm over the future of Goldman Sachs and many strong financials to lift the markets. It is also prepared to partially lighten-up positions on any out-of-the-norm spike and conversely, to load-up on any extreme short term dip. "I'm not very happy about the SZDM beta component which is 1.35 (about a 1/3rd more volatile than the S&P 500 on a daily basis.) I plan to reduce it with time by picking less correlated ETFs from the top ranked list." I'm happy to say now, that paying attention to beta has made me a better investor. SZDM's beta now is way down to a perhaps unsustainable low of 0.65. This means that the risk-adjusted returns of SZDM are 53% better (1.0/0.65 - 1 = 0.53) than the absolute returns when compared to the S&P 500. When I started this journey, I honestly didn't think I can do much better than buy-and-hold given the 2% yearly drag. Such was John Bogle's overpowering spell over me. These days, beating buy and hold is no longer on my mind at all. SZDM is beating the indexes over multiple time periods, both long and short, with significantly lower risk. Beating all the 3 major US indexes has become a very common weekly occurrence by now. I have several ideas in the pipeline on how to improve further. These are mostly compute intensive, (and shorter term) machine-learning approaches that I've never tried before but based on initial experiments and applications to other domains, seem to be very sound. I hope that applying these will help me beat the indexes by much more than 10.57%/year, more than that after risk-adjusting, regardless of the environment: bull or bear alike. Another thing I'm happy with, is that SZDM managed to almost reach the top decile of the Marketocracy ranks (89%) despite going through a rocky start and despite being essentially a learning vehicle. Climb to above the 95% top percentile in the Marketocracy ranks? 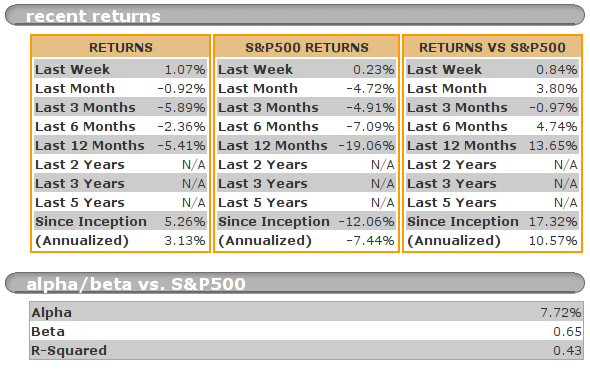 Manage to beat the S&P 500 not only on a multiple period basis, but also on each and every single monthly period? Even better, and much harder: manage to achieve positive returns, in each and every monthly period? Getting there would require much more work and applying methods that are very different from those I have been using so far. I have the blueprints in my head, and I expect to implement some of these over the coming few weeks and months as they aren't trivial and require a lot of coding and testing. As you know I'm not a religious person but this coming Monday I'll be celebrating the Jewish new year. A wonderful time of reflection, fall moods, cooling temperatures, shorter days, and apple dipped in honey. I hope this coming year will be another year of good learning experiences. Let's all raise one for health, happiness, and better, more consistent, risk-adjusted returns.